The History of Classic Turf Company Founded in 1980, Classic Turf Company has more than three decades of experience building sports surfaces. Tumer Eren, owner and founder of Classic Turf Company began by installing asphalt courts in the ‘80s and ‘90s, but quickly realized there was a need for innovation and improvement to what was currently offered in the sports surface industry. In 1991, Classic Turf Company received its first patent for the development of the Classic Turf Sports Surface – a high-tech cushioning system that is the result of modern chemistry and creative engineering. For the last decade, Mr. Eren has researched and tested the combination of Classic Turf Company’s sport surfaces installed over a post-tension concrete base. The result – an industry revolution. Mr. Eren’s years of dedication has produced a product that is superior to any other sports surface on the market. The Installation That Changed The Industry With over 30 years of experience installing and attempting to repair asphalt based sport surfaces, we have reached the conclusion that asphalt surfaces are virtually irreparable. We have determined that the most effective sports surface base can only be created by using the post-tension concrete system. Classic Turf Company has pioneered the installation of the post-tension concrete system in New England. Classic Turf Company has attended numerous training courses and has worked with experienced post-tension concrete installers. The Company is now in the position to install a post-tension concrete base, and guarantee, without reservation, both structural and surface finish for 20 years. The post-tension concrete base along with Classic Turf Companyâ&#x20AC;&#x2122;s patented cushioned sports surface is the only sports surface on the market today that can offer a 20-year structural and surface finish guarantee. The Choice is Classic Turf Your Full-Service Design and Build Company Since we began designing and installing our patented sports surfaces, our installations have proven the test of time with no cracks, bubbling or structural deterioration, and continue to perform at the highest level. Since we began building with the post-tension concrete technology, we have implemented many long-lasting courts without the complications of asphalt. Classic Turf Company strongly believes that the post-tension concrete system must be designed and installed by qualified, certified and experienced firms in order to produce a sports surface base that is of the highest quality. When the post-tension concrete system is installed by firms that do not meet this criteria the sports surface is compromised both structurally and ascetically. This may lead to the assumption that the post-tension concrete system is poor in quality and unreliable when in fact, it is the inefficient installation process and the untrained and inexperienced installer or designer that is at fault. Incompetent design and installations do not reflect the Post-Tension Instituteâ&#x20AC;&#x2122;s (PTI) qualifications and standards. Classic Turf Company is a certified post-tension concrete installer. A Qualified Partnership Working with qualified post-tension concrete installers is crucial to ensuring a quality sports surface that will last. Classic Turf Company is your designer and installer that has a high level of training and expertise in post-tension concrete construction. DID YOU KNOW? One Classic Turf tennis court uses over 400 recycled truck tires. The Standard of Guarantee Based on our many years of experience with asphalt surfaces, Classic Turf Company knows that the post-tension concrete system is the gold standard in sports surface technology. To ensure that you, the client, receive the highest quality post-tension concrete system, we strongly recommend that your designer and contractor meet the following qualifications: ASBA (American Sports Builders Association) Certified Tennis Court Builder PTI (Post-Tension Institute) Member Certified Personnel Installation personnel must have Level 1 certification from PTI (Post-Tension Institute) Contractor/designer employs staff that has a Level 2 certification from PTI and is a professional engineer (P.E.) in the state the job is located to guarantee proper inspection performed prior to placement of concrete. Experienced Designer/Contractor The designer/contractor should have a minimum of five years of experience in the construction of a post-tension concrete system. The designer/contractor must be able to provide a minimum of five references of work completed using the post-tension concrete system within the last two years. Breathable Surface The designer/contractor must provide a breathable, acrylic surface coating or a cushioning surface coating system that is suitable for the post-tension concrete system. Existing coating systems should not have to be removed from the concrete surface when and if re-coating is necessary. Certified Engineering Firm The designer must provide stamped engineering drawings and specifications. The hired engineering firm will be responsible for Level 2 inspection according to PTI requirements, prior to concrete placement. Warranty The contractor provides 20 years structural warranty for the post-tension concrete system. Surface Coating Guarantee The contractor provides a 20-year guarantee for the cushioning surface coating system that is installed over the post-tension concrete base and also provides a consistant maintenance schedule (re-coating the surface every 5-10 years with 2 coats of application; texture and topcoat). Contractor provides 10 year warranty for acrylic surface coating system with a consistant maintenance schedule (see above). PTI Certified Plant Post tensioning material should be supported by a PTI certified plant. Post-Tension Concrete Technology Post-tensioning is a method of reinforcing concrete with high-strength steel strands, typically referred to as tendons. Post-tensioning is performed on the job site in cast-in-place applications. Tendons are installed prior to placing the concrete and later stressed to a specified force. This process induces both compressive forces in the concrete and stresses that counterbalance service loads. The benefits are substantial. While concrete is strong in compression, it is weak in tension. Steel is strong under forces of tension, so combining the two elements results in the creation of strong concrete components. Post-tensioning can help create innovative concrete components that are thinner, longer, and stronger than ever before when compared to asphalt or conventional reinforced concrete. DID YOU KNOW? Classic Turf Company’s Post-Tension Concrete provides a 20-year structural guarantee. Post-Tension Comparison Chart When compared to typical asphalt or conventional reinforced concrete, the post-tension concrete system, and the material itself is the only sub-surface that will provide both a cost-effetive solution and structural guarantee to last a lifetime. Classic Turf Cushioned Sports Surface The Classic Turf Cushioned Sports Surface is a high-tech cushioning system and is the result of modern chemistry and creative engineering. The Classic Turf Cushioned Sports Surface is designed for tennis courts, basketball courts, and multi-sport courts. It is the ultimate, all-weather cushioned athletic surface. Classic Turf's biomechanically engineered SBR rubber produces a soft and comfortable surface, reducing fatigue and excessive impact on players’ back, legs, knees, ankles, feet, and joints. As a permanent installation, the Classic Turf Cushioned Sports Surface is also a water-proofing system and is ideal for rooftops and garage decks. Due to the breathability of the Cushioned Sports Surface, it is one of the only cushioned sports surface that can be installed permanently over concrete. A court built with post-tension concrete and the Classic Turf Cushioned Sports Surface is the highest quality, all-weather sport court on the market. Benefits of The Classic Turf Cushioned Sports Surface 20-year crack-free guarantee. 100% consistent ball bounce and customized speed of play. 30% softer than asphalt or concrete, resulting in less physical wear and tear on players. Waterproof. Breathable and permanent installation over concrete surfaces. Ideal for rooftop installations. Environmentally responsible – manufactured with recycled rubber tires. Fastest drying surface – impermeable to moisture and water. Versatile. The SBR cushion density and surface coatings can be adjusted for a variety of sports (tennis, basketball, volleyball, racquetball, squash, etc.). Investment protection – 100% air, water, and UV resistant. The Classic Turf Sports Surface shields the sub-surface from aging and cracking. Prime Coating Sports Surface Classic Turf Companyâ&#x20AC;&#x2122;s Prime Coating Sports Surface is a patented system designed to be applied over post-tension concrete slabs. The Prime Coating Sports Surface is made up of several different layers resulting in a durable and waterproof system that will seal and protect the post-tension concrete slab for years to come. Benefits of The Classic Turf Prime Sports Surface 10-year guarantee. Cost-effective. Waterproofs the concrete slab. Indoor and outdoor use. Durable. Withstands the abuse from bikes, roller blades, skateboards, etc. Unlimited re-coating without removal of existing surface. Sports Surface Comparison Chart When compared to typical hard court sport surfaces and foam courts, Classic Turf Companyâ&#x20AC;&#x2122;s Classic Turf Cushioned Sports Surface and Prime Coating Sports Surface has proven to be the better investment time and again. NOTE: The above chart is based on the sports surfaces being installed over a post-tension concrete base. Classic Turf Company provides a 20 year structural warranty for: • Structural cracking. • Heaving/settling – any vertical movement in the slab from it’s original placement. • Standing water – standing water exceeding depths of more then 1/8 inch in depth. The following items are not covered under this warranty. This includes, but is not limited to: • Any damage to the slab due to acts of God. • Deliberate human destruction. Classic Turf Company provides a 20 year surface warranty on the Classic Turf Cushioned Sports Surface when installed over a post-tension concrete slab for: • Delamination of the Classic Turf Cushioned Sports Surface from the concrete slab. • ANY surface cracking on the acrylic coating or the rubber mat. • Separation of joints. • Bubbling or peeling of the surface. • Unlimited re-coating process – The Classic Turf Cushioned Sports Surface can be re-coated as many times as the owner requests without the removal of any previous applications. The re-coating process will not affect the surface flexibility or softness. NOTE: The Classic Turf Cushioned Sports Surface should be re-coated anytime between 5-10 years depending on usage. Re-coating consists of one coat of texture color coat and one coat of color top coat. The re-coating will be at owner’s expense. For warranty information on the Classic Turf Cushioned Sports Surface when installed on top of bases other then post-tension concrete please contact the Classic Turf Company. The following items are not covered under this warranty. This includes, but is not limited to: • Any damage due to acts of God. • Deliberate human destruction. • General misuse of surface including but not limited to: skateboarding, street hockey, cleats and improper footwear other then tennis or basketball shoes. Classic Turf Company provides a 10 year warranty on the Prime Coating Sports Surface when installed over post-tension concrete slabs. The warranty is for: • Bubbling or peeling of the acrylic coating. NOTE: The Prime Coating Sports Surface needs to be re-coated anytime between 5-10 years depending on usage. For warranty information on the Prime Coating Sports Surface when installed on top of bases other then post-tension concrete please contact the Classic Turf Company. The following items are not covered under this warranty. This includes, but is not limited to: • Any damage due to acts of God. • Deliberate human destruction. Customized Accessories Fencing Systems At Classic Turf Company we fabricate our own custom metal fence system that ensures a 20-year guarantee. We do not use standard round pipes and fittings. We use two-inch galvanized structural square tubing for posts, bottom, top and middle rails. Our fences are welded at the joints, creating a seamless, uni-body system. The frame is then painted with two coats of paint color of the customer’s choice. Why do we build this way? It’s simple – durability. The welded fence frame will not allow the fence to become disjointed, crooked, and loose as often happens with the conventional chain link fence. Our welded fencing system is exclusive to our customers. Practice Backboards Practice boards can be an integral part of a well designed tennis court, allowing thousands of controlled repetitions, even without a playing partner. Classic Turf Company uses Rally Master Backboards, manufacturer of the best backboards in the industry. Solid polyethylene panels come with a 20-year warranty. These panels will not deteriorate in the weather and will stand up to the harshest abuse more than any other backboard, no matter the sport. Lighting Systems Classic Turf Company features LSI and Musco industrial sport lighting systems, which are the most energy-efficient, high-performance tennis lighting systems in the industry. LSI lighting systems are primarily used for residential courts, offering more light and less energy with a ‘Forward Throw Reflector’ system, which reduces glare, light spillage, and sky glow. Musco lighting systems are primarily used for municipal courts, parks, and schools. Musco offers a wide array of lighting solutions with custom fabrication options. Both offer options for LED systems. Basketball Systems Classic Turf Company offers a variety of basketball systems suitable for any level of play. Two of the most popular systems are the Ultimate Adjustable System – a gymnasium-quality backboard system that comes with adjustable heights from 7-1/2’ to 10’, which is great for younger players learning the game or older players who want a competition-height basket. The Ultimate Basketball System features the gymnasium-quality backboard system, but with the same features and dimensions of professional competition equipment. Why Do Customers Choose Classic Turf? Research and Development Our company is dedicated to continuous research and development in order to create a more simple and cost-effective product. Doing business with Classic Turf Company is more than just about a high-end product. It’s about dealing with a company that works with its customers, every step of the way, to provide its clients with a customized sports surface facility that is unmatched by any other company in the industry. 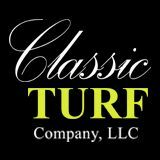 First Class Customer Service Providing a high quality product and exceptional customer service has been part of Classic Turf’s mission since the company was founded in 1980. Our customers are our number one priority; which is why we work closely with our clients throughout the entire process from design to installation. Whether our clients are looking for a state-of-the-art, professional level sports surface or a simple practice court for their children, Classic Turf Company treats every project with the same level of dedication. Environmental Commitment The SBR rubber of Classic Turf Company’s Cushioned Sports Surface is made from 100% recycled truck tires. Just one tennis court using the Classic Turf Cushioned Sports Surface requires 400 truck tires. Scrap tires present unique recycling and disposal challenges because they are heavy, bulky and made from a variety of materials. Over 3 million tons of tire waste consume landfills each year due to the challenge of recycling scrap rubber. Classic Turf Company was one of the first in the industry to use recycled rubber for indoor and outdoor sport surfaces. For the purpose of this test programme the sample was laid on a concrete floor. The record temperature was 23 degrees celsius, with a relative humidity of 48%. 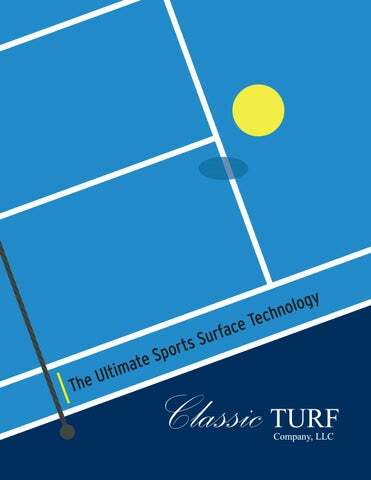 CONCLUSIONS The mean results places the shock absorbency properties of Classic Turf System into Moderate category of the classification scale detailed in the Initial ITF Study on Performance of Tennis Court Surface. Select Clients Classic Turf Company has been installing public and private tennis court and basketball court systems for clients across the U.S. and overseas for over 30 years. We work closely with our clients to provide a customized court design, which offers an unparalleled sports surface that will last a lifetime with a 20-year, crack-free guarantee.